GourMaybe: Should servers depend on tips? Do Servers Deserve a Real Paycheck? I have often played with the idea of writing a food/opinion column. I pitched the idea when the Saucon News was still a small local weekly, one that was later bought out and grouped with a series of five other new weeklies by Berks-Mont Newspapers/Journal Register company. That became the Lehigh Valley News Group and at its creation in 2006, I served as managing editor. But this little opinion column predates all of that, and honestly I had forgotten about it until I recently dug through the crate of news clippings I have in my home office. I tackle the question: should servers receive a real paycheck? 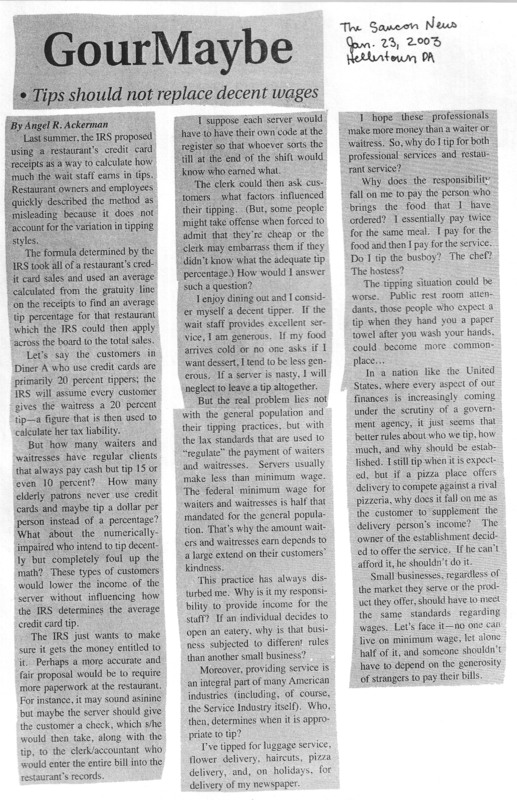 This was at the time that the IRS was considering using a restaurant’s credit card receipts to determine an average amount that each server earned in tips and then use that as a basis for income tax liability.